with everything they need to be self-confident and stay true to their authentic selves as they navigate their ever-changing social surroundings. These resources are here to help give parents and caregivers the tools they need to model healthy self-esteem and body image for their children, and help build their self-confidence. 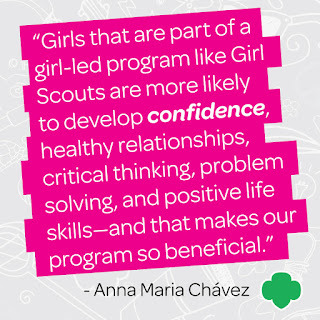 Andrea Bastiani Archibald, Ph.D., applied developmental psychologist and chief girl expert at Girl Scouts of the USA! üShow up for each other. Cheer each other on at sporting events, concerts, etc. Send a quick text to check in on the big test, or brainstorm on the couch on how to solve a social situation at school. ü Encourage each other to try something new and out of your comfort zone. Did you know that just daring your daughter to try something new can inspire her own self-confidence? Protecting them all the time—even when well intentioned—can make kids feel incapable or incompetent. ü Encourage direct communication. Empower kids to speak their minds—in respectful ways, of course! ü Watch how you talk about yourself and your daughter. Don’t talk negatively about your own body and don’t praise your daughter solely for her appearance. This only serves to decrease her self-confidence, instead of building it up. ü Commend her on the things that really matter. Compliments should focus on taking on a new challenge, persisting and real accomplishments! ü Consider how you speak about others, too. Are you judgmental and/or insulting about others’ appearances (even those on television or in movies)? ü Encourage regular physical activity in your daughter and model it, too. Instead of going to get your nails done, go for a bike ride or a walk. Help her see her body as strong and capable, not just “pretty.” Teach her to have self-confidence about her whole self. ü Don’t limit her choices. Buy her games traditionally marketed to boys, and if she’s interested, push her to explore subject areas (STEM) and sports that are more often targeted to boys. ü Don’t model all-or-nothing thinking. Life is a balance and mistakes are expected! Show your kids that you try, you make mistakes, and you just get back up and try again (same thing for trying something new). ü Recognize and let your kids know that life can be bumpy. Unexpected and challenging things—large and small—can happen, and it’s how we handle them and move on that matters. Explain this to her and let her know you, as a parent, are always there for her. ü Try to remember (and encourage your kids) to be aware when they are only focused on the emotions of a situation, encouraging them to focus with their minds as well. ü Try not to “make a mountain out of a mole hill.” Keep perspective and model this for your kids, too. ü Practice and encourage “fun failure.” This is the idea that even when you try something hard or new, if it doesn’t work out, it’s okay and you probably learned something from the experience. Express the idea that making a mistake shouldn’t hold her back from trying again—self-confidence is the key to success! ü Express gratitude by FOCUSING on who you are and what you have, not what you don’t. Saying “one thing we are thankful for” shouldn’t be just reserved for Thanksgiving dinner! Make it a daily question over dinner. It can be something big or small, and make sure to share real things you are thankful for with your kids, too. Take self-confidence to the next level! 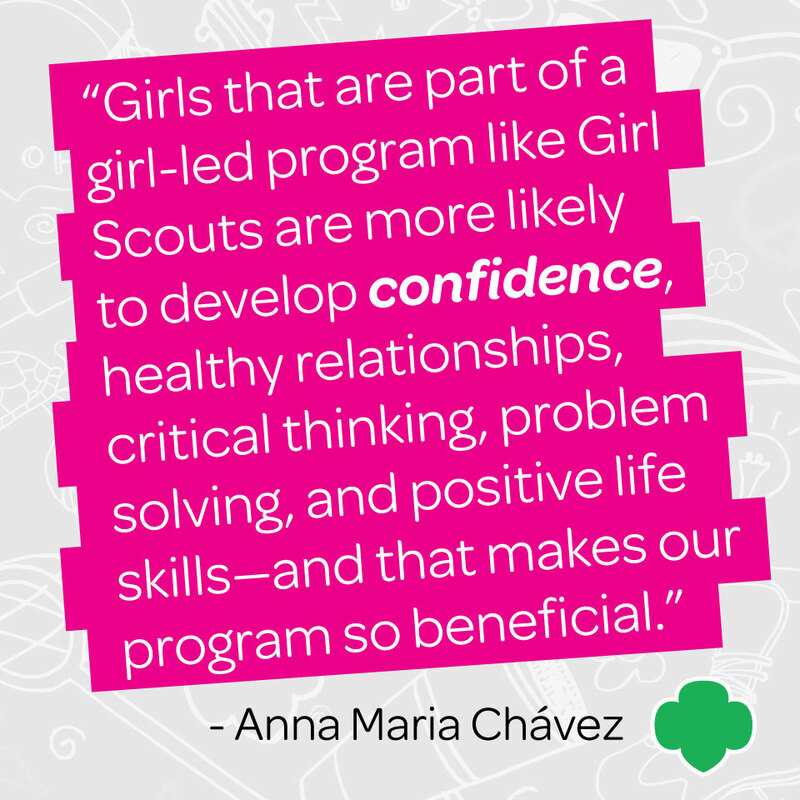 Remember, at Girl Scouts we build girls of courage,confidence, and character every single day. Our program is supportive of all girls, and allows them to try new things, test their limits, and develop their passions and so much more. Claim your girl’s spot! Troops are forming now. Join or volunteer today!